Our products are beautiful yet durable… which makes them perfect for the rental company looking to offer their customers unique products that are not seen everywhere, but are designed for and will withstand the rigors of the rental industry. 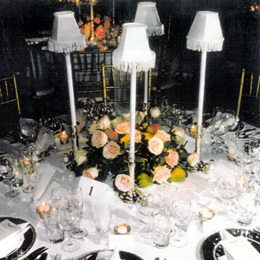 Table candelabra centerpieces or individual lamps make stunning centerpieces, as do our other serving and accessory accent pieces. 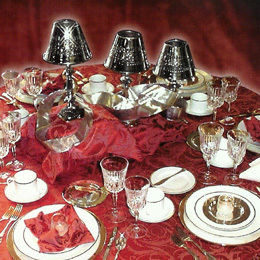 From trophy bowls that will float roses… to an angel centerpiece perfect for flowers, greenery or potpourri… to an unusual "lady holding plate" cake or pastry stand… our designs are beautiful… durable … and affordable to the rental industry. Many of the orders we do at the ARA show are for basic style lamps that can be updated by adding a new or different style shade. Many customers buy a nickelplate base so it won’t need polishing or solid brass lacquered, and then add several different shade styles to satisfy their customer’s requests. The lamp styles that accept our threaded extender poles allow many different looks and heights to be made from the different size poles and shades! e-mail us for the name of a rental company in your area that carries our products.